Excelsior is Boca's premier luxury oceanfront condominium residence located at 400 South Ocean Boulevard in Boca Raton, FL. This ten-story luxurious waterfront condominium community features just 28 ultra-luxury units which are located directly on the Atlantic Ocean. 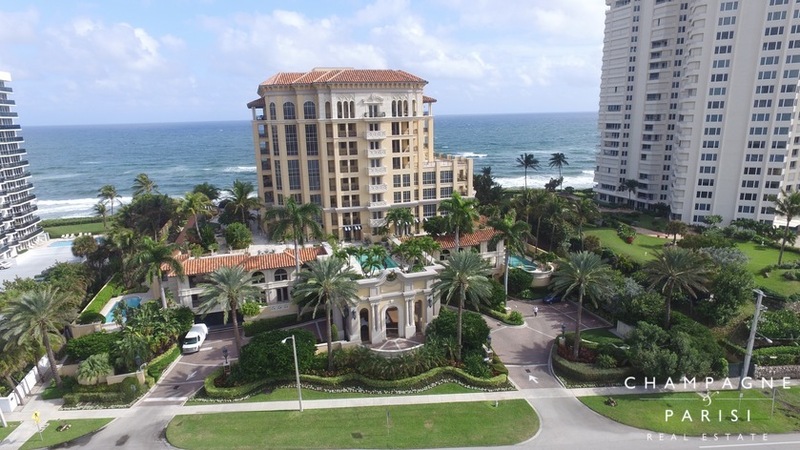 This exclusive beachfront condominium building was specifically designed to deliver the most magnificent views of the crystal blue waters of the Atlantic Ocean and Boca's pristine sandy beaches. Designed by world-renowned architect Alfred Karram, the Excelsior has earned several awards since its development in 2002, including "Best New Address in Boca Raton" by House and Garden Magazine. This impressive building boasts a European Palace-inspired design and was constructed using the only finest materials from around the world. Condos for sale in Excelsior offer between two to four bedrooms with between 4,000 and 5,100 square feet of lavish living space, artfully designed to accentuate the breathtaking views. Condos in Excelsior boast a seemingly endless list of extravagant features, some of which include spacious open layouts, wood and marble flooring, oversized bedrooms, custom walk-in closets, custom cabinetry, granite and marble countertops, and luxurious bathrooms with large baths. In addition to the luxury condos that boast a multitude of high-end designer finishes, there are also four seaside villas with individual private courtyards and pools for those desiring home-style living in a luxury building. Excelsior residents enjoy the use of a host of on-site amenities including a gorgeous oceanfront pool, beachfront cabanas, state-of-the-art fitness center, on-site beach manager, full-time concierge, beach attendants, 24-hour security, underground parking, private storage, and boat slips accommodating yachts up to 60 feet long. Residents also enjoy nearly 300 feet of private beachfront access. Located just south of Palmetto Park Road on A1A, Excelsior is close to South Beach Park and the exclusive Boca Beach Club. Those residents at Excelsior who are golf enthusiasts can take advantage of the Boca Raton Golf Club or the Royal Palm Yacht & Country Club, both of which are just minutes away. Just minutes from downtown Boca Raton, Mizner Park, and Royal Palm Plaza, Excelsior is close to some of the area's finest dining, shopping, and entertainment venues. With its custom luxury residences and premier location, Excelsior offers its residents truly the finest in Oceanfront condominium living in Boca Raton, FL. If Excelsior sounds like a place that you would love to call home, you may also want to visit some of the nearby ultra-luxury condominium communities such as Aragon and Luxuria, which also offer premier oceanfront condominium living in Boca Raton. If you are interested in purchasing an Excelsior condo for sale or would like more information about other luxury condominiums for sale in Boca Raton, please call us at 561-998-9015. You may also reach us by filling out the simple online contact form provided below and one of our luxury condominium specialists will reach out to assist you promptly. We at Champagne & Parisi Real Estate look forward to assisting you in finding your next dream home in always sunny Boca Raton!